The first cake I ever baked, outside of an Easy-Bake oven, was a sour cream coffee cake from my mother’s stained recipe book. 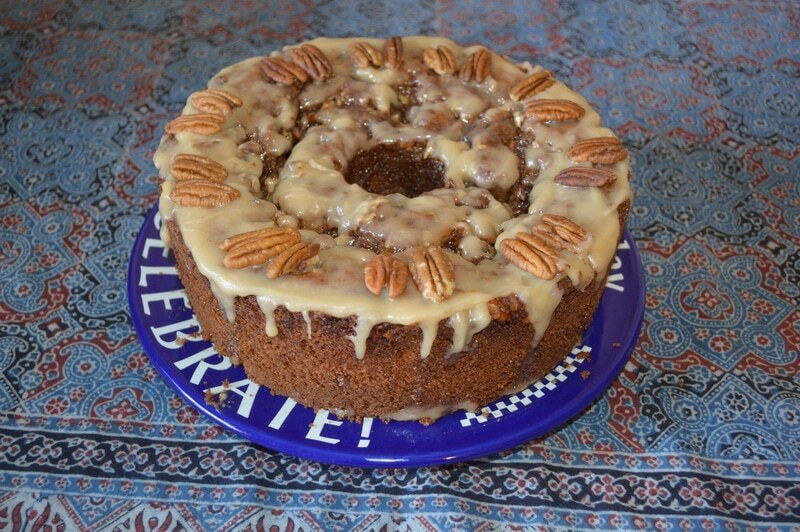 It was an easy one bowl cake with a cinnamon nut streusel topping, that swirled through the cake, as it baked. It seemed almost magic to an 11 year old. I’ve made it many times since. It’s simple, inexpensive, and I usually have all the ingredients on hand. This one is made with freshly ground whole wheat flour — but you can use all-purpose flour, instead. Crunchy streusel, cinnamon, nuts, and soft moist cake that doesn’t need icing, is a perfect dessert for coffee time or to carry to a potluck. Which is what I did with this one last Sunday. My version uses kefir, a fermented milk product, similiar to yogourt, in place of the classic sour cream (*See my note below.). There’s a few other tweaks in it that made for an amazing fragrant, and moist dessert. And the best part is that I made the cake after breakfast on Sunday morning and it was ready before we had to leave. It doesn’t get any easier. Time: 20 prep minutes plus 1 hr. and 15 min. Mix butter and sugar together until creamy. Stir in cinnamon and nuts and mix till crumbly. Set aside. In a large mixing bowl, cream together coconut oil and sugar. Beat in kefir. Add vanilla and eggs and beat after each addition. Without mixing, add flour, baking soda, and baking powder. Beat just until the dry ingredients are mixed in with the moist ingredients. Do not over beat. In a well greased and floured angel food cake tin or bundt pan, spread 1/2 of the batter. Sprinkle 1/2 of the streusel. Spread the remainder of the batter on top. Smooth out the batter surface. Sprinkle the remaining streudel over the top of the batter. Preheat oven to 325F. Bake the cake in the oven for 45 to 50 minutes, or until toothpick inserted into cake comes out clean. Cool on a rack for 10 min. Remove from pan. Continue to cool on the rack until just warm. Drizzle with glaze and garnish with pecans if desired. Melt butter and add powdered sugar. Mix well with a fork or a whisk to remove any lumps from the sugar and achieve a smooth consistency. Add vanilla and kefir. Beat well. The consistency should be smooth and liquid. If it is too thick to drizzle, add more kefir 1 tsp at a time. If it is too thin, add more powdered sugar, 1 tsp. at a time, until desired consistency is achieved. Spread over the top of the cake, while the cake is still warm. Drizzle a small amount down the sides of the cake. 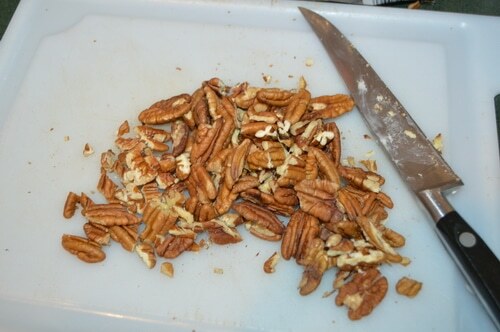 Garnish with pecan halves, if desired. *I have made this recipe successfully with yogourt, cultured buttermilk, or sour cream used in the place of the kefir, in equal proportions. 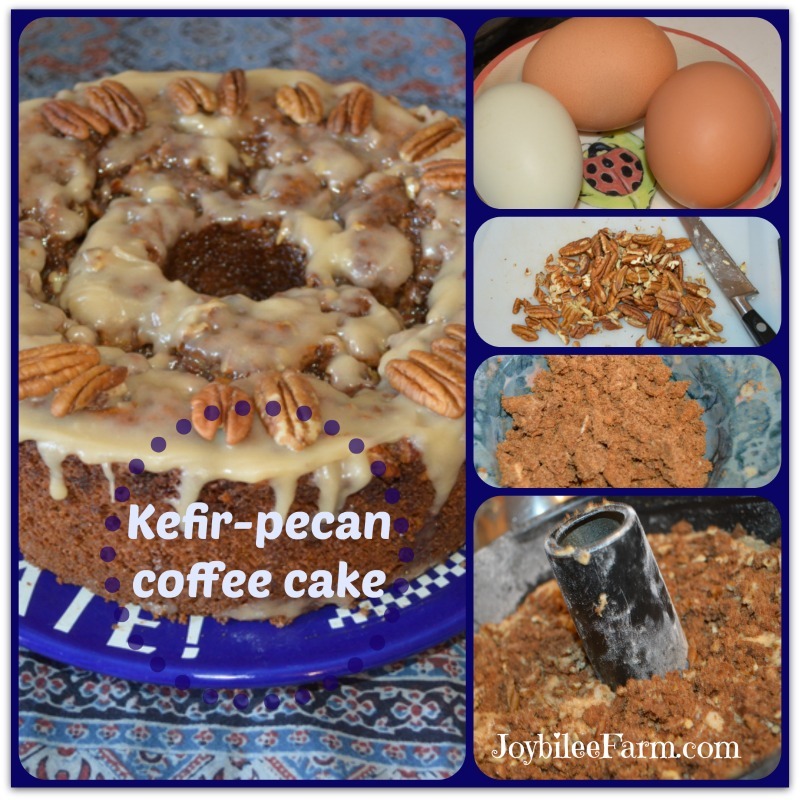 No other changes are necessary to the recipe if you are substituting kefir for another cultured dairy product. I use a Wondermill Grain Mill to grind my whole wheat berries. It’s fast and very quiet. I recommend this mill over the other grain mills I’ve tried. See my grain mill review. Previous Post: « What’s a nice Christian like you doing celebrating Passover?